IFSC (Indian Financial System Code) code contains 11 alphanumeric unique code and is assigned by RBI to the bank to facilitate NEFT, RTGS and IMPS transfer to each branch of every bank in India. 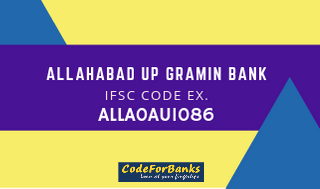 For example, Allahabad Up Gramin Bank Ifsc Code Alla0au1086 Banda. The first four letters denote the bank name, which is HDFC, followed by the fifth character which is zero and the remaining six characters which denote the exact branch code. The IFSC Code is printed on cheque book for NEFT enabled banks. You can use IFSC Code to identify particular bank branch of any bank in India. The IFSC code used for Real Time Gross Settlement aka RTGS, NEFT and IMPS finance transfer systems. How to Find Your IFSC Codes? If you are looking for IFSC Code to make RTGS or NEFT transaction from any branch, can easily find it online. Also, you can find the IFSC of your home branch printed on your chequebook. A person can also find IFSC Code from official website of . Another way is select your bank name, select the state and than select your district, finally select the branch of your bank to find bank IFSC Code along with MICR code for any branch. The easiest way to Find IFSC Code for banks in India is to select your bank name, select the state and than select your district, finally select the branch of your bank to find bank IFSC Code. The another way is, select bank name and than branch name from given list. How to Transfer Fund Using NEFT, RTGS and IMPS? You can make any financial transaction using NEFT, RTGS and IMPS with any branch across the country. However, to perform such a transaction, you must have the IFSC Code of the recipient bank branch. IFSC is the safest and easy way to make online transaction. The NEFT is a nation wide payment system facilitating one-to-one hassle-free and convenient online fund transaction. It operates on a deferred net settlement (DNS) basis and settles transactions in batches. HDFC has fixed a time schedule for such transactions and not available on the bank holidays, RBI holiday and Sunday. RTGS or Real Time Gross Settlement is a super-fast money transferring method. RTGS is an abbreviation for "Real Time Gross Settlement". RTGS can be defined as specialist funds transfer system to transfer the money from one bank to another on continuous (real-time) and gross settlement basis. It allows the individuals as well as the companies and the firms to transfer funds from one bank to another bank within the country.